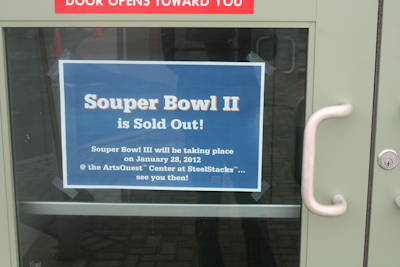 If you were one of the lucky 350 people that got a ticket for Artsquest‘s Souperbowl II on Saturday you no doubt had a load of good food. For those of you who didn’t, here’s the rundown of what was there. 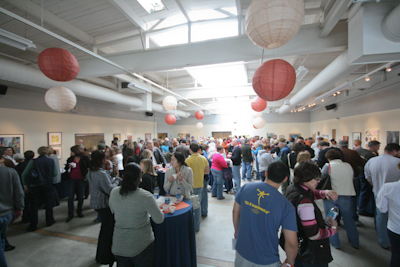 The event benefited Artsquest’s B-Smart program. 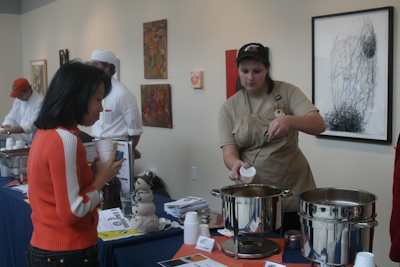 The El Vee was there judging and, like last year, had every one of the soups barring the shellfish-laden ones. Instead of going through and critiquing each one (which would take forever), I’ll just touch on some of the highlights. Molly’s Irish Pub and Grille had a fantastic cheeseburger soup ridden with potatoes. Zoup also had a Cheeseburger Royale soup, but Molly’s took the cake because it was far less salty and had a better, more authentic flavor. Both Grumpy’s Bar-B-Que Roadhouse and Northampton County Community College’s Hampton Winds student restraunteurs made variations on chicken paprikash and both had their merits. Grumpy’s included a large pierogi in their soup that added to the depth. 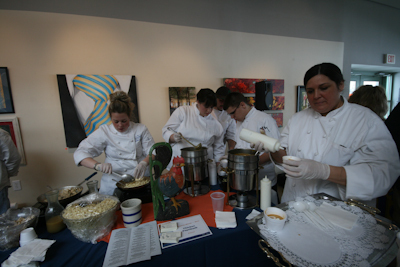 Hampton Winds had their same setup from last year, with all of the students working together to craft the soup. It was delicious, but lacked the complexity that Grumpy’s had. Copperhead Grille surprised me with their Texas Red Chili. I love extremely hot chili so I expected this to fall short for me. 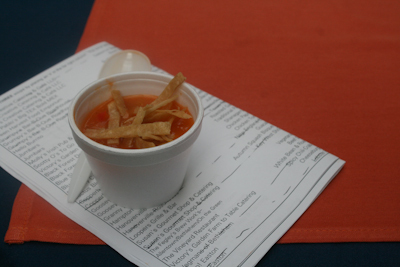 Although it wasn’t hot enough to make you sweat, their chili had a great kick and a hearty, complex taste that really won over all of the judges. 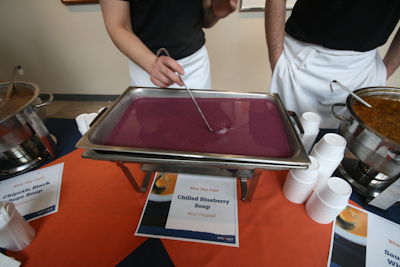 Blue Sky Cafe had one of my favorite soups of the event. A treat that I used to get at Wegmans all the time, they crafted a delightfully creamy chilled blueberry soup. It was like summer in a cup and I could’ve easily taken a quart of it and drank it like fruit punch. Goosey Gander had a roasted garlic potato that slapped you in the face with all of its garlic. Definitely not for the garlic-wary, it was very intense and great. 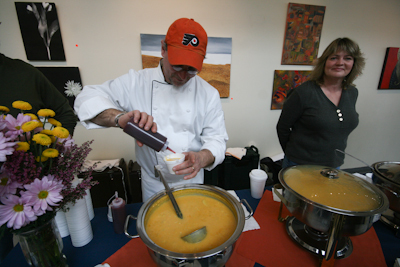 In what seems to be a fall staple nowadays, three restaurants made squash soup. 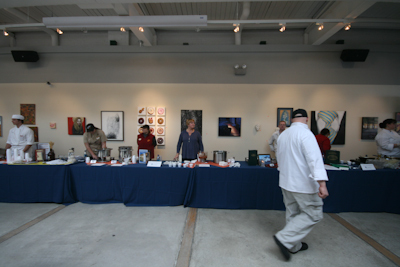 The two best were from Susan’s Gourmet Shop and Catering and Cathy’s Creative Catering & Cafe. 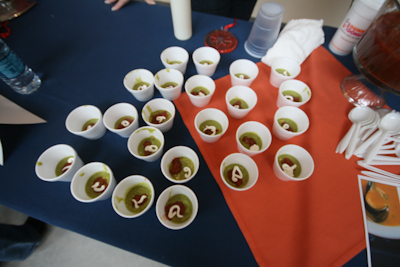 My personal favorite was the Autumn Squash Bisque with Raspberry Coulis from Susan’s, while the other judges favored the Butternut Squash and Pear from Cathy’s. I think the raspberry was better due to the flavor the sauce imparted on the soup. In the pear soup the pear seemed hardly noticeable to me, adding only a slight sweetness. 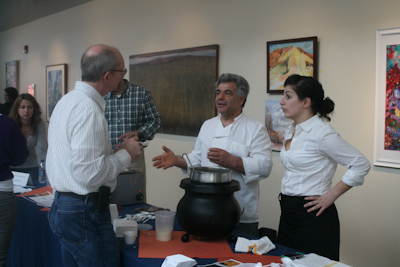 Below is the full list of restaurants, soups, and winners, as well as some photos of the event. 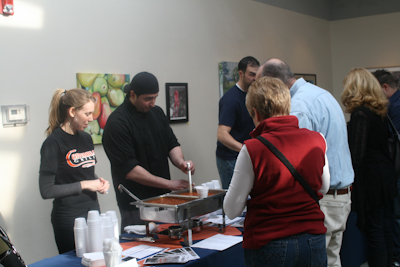 Thanks to Artsquest for inviting The El Vee back for a second time and we hope to participate again next year when the Souperbowl III will be held at the SteelStacks center allowing a few more hundred people to attend!